I’m a Newly Certified Death Midwife! On March 13, after having been informed that I passed my comprehensive exam with 100% accuracy, I officially became certified as a Death Midwife. Rev. Angie Buchanan, co-founder of and minister in an excellent Pagan church called Earth Traditions, travels around the country teaching Death Midwifery weekend intensive workshops that culminate in certification. What is Death Midwifery? Many people are familiar with the concept of a midwife who assists a mother-to-be with the birth of her child or children; a Death Midwife, as I see it, helps birth people into the Spirit World. She or he is a companion, even a guide, who supports the dying and their families by providing non-medical, holistic, compassionate care. Serving as a liaison between the medical and the funerary industries, the Death Midwife ensures that the end-of-life process is infused with dignity and respect for the dying throughout. 827,060 gallons of embalming fluid, which includes formaldehyde, that leaches into local water sources! Whatever your religious sensibility or lack thereof, anyone who cares for the well-being of the planet will agree that this is not a viable option. Neither is cremation, surprisingly, from a resource-consumption and carbon-footprint perspective, as it is an ecologically destructive, highly pollutive endeavor. So where does that leave one? I have a vision for what I want to have about my own funeral, but before I detail it with you, I’d like to spend more time on why I embarked upon this unique–what some may think of as “morbid”–weekend of training last month. Actually, March 1 was when thanatos took hold of my consciousness in earnest. I’d learned a couple of weeks prior that one of my esteemed mentors in psychology, thanatologist Dr. David Kessler–author of numerous clinical and non-clinical books on the subjects of death, dying, and grieving–was going to be in the Chicagoland area, teaching a day-long seminar called The Needs of the Dying (based on his book of the same title). I was perhaps one of no more than five or so people in the hotel ballroom where we’d convened who wasn’t there to receive continuing education credits; the place was packed with practicing hospice nurses, ER physicians, therapists, and hospital social workers. When we stood up to individually introduce ourselves and say why we had signed up for this seminar, I announced that I’m clergy in a minority religious tradition and I wanted to learn as much information as possible to better serve as a steward to my community as well as my own family. After all, I am the only remaining child with no other living relatives in this country, and my parents are both in their late 70s with chronic health problems. The last thing I want to have happen is to be blindsided with decision-making when I’m not emotionally ready, which is what happened to my parents and me when my 20-year-old brother, Mark, was killed suddenly in an accident. I’d rather open an honest dialogue with my folks so I can understand what their wishes are now so that they can respectfully be fulfilled when the dreaded time comes. Predictably, it was not just an incredibly informative day–e.g., learning the differences between palliative versus hospice care, what the various forms of advance directives are (do you know what a POLST form is? You’d better. ), etc.–but an emotionally impactful one as well, particularly when we were discussing the Five Stages of Death and Grief, the phenomenon of anticipatory grief (I’ve been going through a lot of that lately), the importance of involving children in the grieving process, and spirituality. By the time the seminar ended at four o’clock, and I exited the hotel to discover a parking lot coated with inches of newly fallen snow, my chest felt heavy, as if I’d just attended the funeral of a friend. Take that sensation and amplify it a hundredfold–that’s what the three-day-long Death Midwife training and certification felt like in comparison when all was said and done. As at the end of an intense ritual or shamanic working, I had a considerably difficult time readjusting to “consensus reality” for hours afterwards, and would recommend to anyone considering taking such weekend training to take the following Monday off work and not deal with the pressures of externally imposed obligations if you can help it. The Death Midwife training session I attended took place from March 11-13 at a hotel in the lovely (and affluent) northwest Chicago suburb of Lincolnshire, Illinois. (The Shire!–yes, the landscape out in Lake County is rather Hobbity, and that’s one of the reasons I love driving up there.) Fortunately, my favorite forest preserve (Half-Day Road Woods) in all of Northern Illinois is located very close to where the training occurred, so when I needed some Alone Time during our lunch breaks, I hit my favorite hiking trails and communed with the red-winged blackbirds and large-mouth bass in the lakes. It’s very easy to muse upon the interrelatedness of death and life while you’re treating your lungs to fresh air and race-walking, thinking the entire time about the video on home funerals you’d just watched as a class, while a few feet away from you, Nature’s ongoing drama of Life-Feeding-Upon-Life takes the form of a red-tail hawk ripping into the flesh of its field mouse quarry. During our introductions first thing Friday morning the 11th, when I stood up and announced that I wanted to become a Death Midwife because two of the so-called Dark Goddesses I serve as a Priestess compelled me to, I was met with comprehending nods. Not surprisingly, I wound up meeting and befriending fellow Hekate devotees. There were about 20 people in my class, and one of the lovely things we got to do that bonded us as a group from the outset was create a communal altar for our beloved dead. 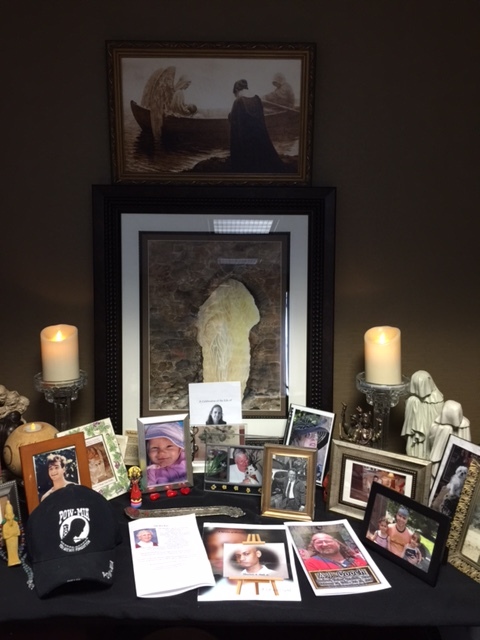 A photo of my brother (left, tall wooden frame behind the POW-MIA cap) and beaded Osiris statue necklace were among my offerings for our group altar for the dead. One thing we all shared as a group, whatever our religious beliefs (I met the coolest Presbyterian minister ever, incidentally–Anne Benvenuti is the author of Spirit Unleashed, a book about the spirituality of animals), was the desire to destroy American culture’s ridiculous denial and fear of death. The goal is to no longer have death relegated to “taboo” status. Things that are not talked about are taboo, and things that are taboo are not talked about. Death Midwifery is about vocalizing and sharing, about providing emotional, spiritual, and practical support for the dying and their families. It’s about being a witness, a repository of sacred space for wholeness and healing to take place. We did that for each other as a class, and I loved learning about the beloved dead of my classmates–the photos and mementoes on the altar. Names. Stories. Everyone in that room became my sister and brother in spirit. And I love them fiercely. Again, the entire weekend was quite an intense, content-rich educational experience. I learned a great deal about how powerful and manipulative the funerary industry is (not one state in the Union requires the dead to be embalmed, folks. Know your rights! ), concealing from the American public the environmental hazards of embalming. I learned about the physical and psychological symptoms of the dying, and the best ways to be present at each stage as well as assist in post-mortem handling of a body for a home funeral (we did literal hands-on training here!). We surveyed all the forms that currently exist in this country for body disposition, including novel methods such as fetal egg tree pods (biodegradable), the Infinity Mushroom Suit, promession, and other eco-friendly alternatives to either a traditional burial or cremation. We talked about financial planning, about the impact of death by suicide, and ways to create sacred space when keeping a vigil with the dying. We watched documentaries about conscious dying and home funerals around the country; we discussed forms of disenfranchised grief such as suffering a miscarriage or losing a pet. So much information and emotional processing to inform the soulscape of the Death Midwifery movement. The emotional intensity became overwhelming at times, and I was glad to know I wasn’t the only one shedding a tear on occasion. It felt good to swap stories of loss and grief, stories of bad experiences with funeral directors during loved ones’ deaths, with people who knew what you’d been through. We’d offer Kleenexes and hugs during breaks and meal times to help with emotional processing. I found that it felt even better to channel those energies physically, not just have them contained at a cerebral level (maybe that’s an Earth Sign thing), so I was very grateful for when my new friend Samantha (ex-military), who had driven all the way from Missouri to take this training, kindly let me use her electronic room key to access the hotel gym so we could lift free weights together and sweat our stress away during several of the breaks. We had all started talking as a group towards the end of the second day of training about how intimidated we were by the comprehensive essay exam the following day that would determine whether we’d pass our training and become certified or not. While she’s certainly a loving and compassionate woman, Rev. Buchanan, our facilitator, certainly had an air of inexorable authority and toughness to her. This was going to be quite an exam! Our notebooks became treasured repositories of knowledge; we flipped through pages nervously to quiz each other during breaks on various terms, concepts, stages, and acronyms. It was giddy, almost like we were all high school kids taking the SAT together! On our third and final day, we watched another documentary film, took turns with role play on tending to the dying, performed a mock home funeral, and then launched into the exam. I had my hand carved-from-Brazil smoky quartz 9-inch diameter crystal skull (his name is Mordecai) with me for test-taking mojo and overall Underworldly companionship and grounding. He helped! I was one of the last people to hand in my test and then all eyes were on Rev. Buchanan as she graded each booklet. She’s got a good poker face, I’ll say that, as I couldn’t scrutinize any emotional reaction from her as she read. I nervously drummed my fingers on my desk, then I scooped Mordecai into my bosom to help ground myself. Eventually, Rev. Buchanan stood up and announced that everyone had done splendidly–we all passed our exams and have become certified Death Midwives! A kind of graduation ceremony ensued, with names being called out and diplomas distributed. It was a joyously heartfelt moment, not just because of the sense of pride in accomplishment, but because after these three intense days, I’d come to know each of my classmates/Death Midwives-in-Training as the lovely and unique souls that they are. We applauded each other vigorously, exchanged hugs, and had group photos taken of us. “Thank you,” I tearfully said, completely amazed and humbled and uncharacteristically devoid of speech. The lady who’d sat on my left during class, Janice, asked, since she was also a city-dweller, if I wouldn’t mind dropping her off at the subway stop I myself take once we’d gotten into Chicago. Of course I didn’t mind. It was a very rainy afternoon and we were stuck in traffic on I-90 heading eastbound into downtown Chicago, and I enjoyed her company and our spiritual discussions, especially ones detailing our involvement in the organizations we belong to (she was curious about membership in the Fellowship of Isis; I learned she was actively involved in a local Unitarian Universalist church’s CUUPS program). When it was time to pull over outside the subway platform, anxiety stabbed at my heart. “Janice, this is it; we’re back in the ‘real world’ now,” I said. I got out of the car as she did so I could hug her again, and we exchanged business cards. I drove away from the subway station in the pouring rain feeling sad, bereft of loving faces and voices, and somewhat fearful too–as if my own grave were yawning ahead of me to receive me in that moment. It felt very good to nuzzle my face against my cats’ tummies first thing when I got home and they greeted me at the door. My Bodacious Beau asked me how it went; I started to get manic and work myself into a tizzy, flailing my arms, wondering how I could possibly articulate the enormity of what I’d just gone through. I’m working on my website for my chartered Iseum in the Fellowship of Isis, The Iseum of the Rekhet Akhu. I’m going to list Death Midwifery as one of the services that I offer. Stay tuned, gentle reader! ← My Latest Paintings Will Debut at an Upcoming Exhibition on “Ritual”! A powerful and informing training. My pleasure, Pamela! Thank you for reading this piece and giving me feedback! Congratulations on the successful completion of your training, and thank you for being so willing and eager to help address this dark subject. I am sure that my mother-in-law and countless other blessed ancestors appreciate it! Thank you, my friend! With Nephthys and Hekate Khthonia compelling me to undergo the training, saying no was not an option! This was beautiful, and powerful! There should be more Death midwives in the world! Thank you, Ashley! I couldn’t agree more!